After 2 events (4 heats) of the VRC, the championhip lead has changed hands from Warren "Wal" Lee & David "Shermo" Lethlean to Nathan "Spew-boy" Reeves & newly appointed VRC Management Group Chairman Scott Spedding. The big question now is can MUCC competitors Matt Swan & Paul Franklin hold onto 3rd place in the championship now that Jesse "The Bullet" Robison & Adam "Braveheart" Wright have arrived back on the scene in the newly constructed GC8 WRX. Jesse put in a very strong performance with some spectacular stage times at Bega and is likely to be challenging for outright wins for the rest of the season. 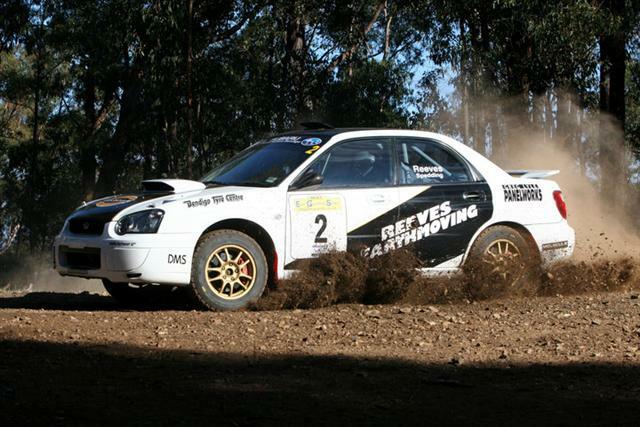 43 crews faced the starter for the first round of the Victorian Rally Championship ? the East Gippsland Stages ? on May 15th 2010. Crews faced 5 stages in daylight, then a further 5 at night. Peter Otzen and Paul Franklin will be organising a "skatta style" Touring Assembly for the HRA on June 6th. It is a multiclub event. We would be only too pleased to welcome MUCC members along - the event could become part of our Club Championship also perhaps. Perhaps members with fond, and not so fond, memories of classic Night Skatters from the clubs past may like to have a go in the daylight. Get the supp regs here. Nathan Reeves and Scott Spedding of Reeves Racing have had his first outing of 2010. With a new look sticker scheme and a great desire to win the State Championship, Nathan and his co-driver Scott, have won the first round of the Victorian Rally Championship, the East Gippsland Stages. This was just the start the pair needed, with an aim of winning this years championship, after last year coming runners up in the Tasmania Rally Championship.